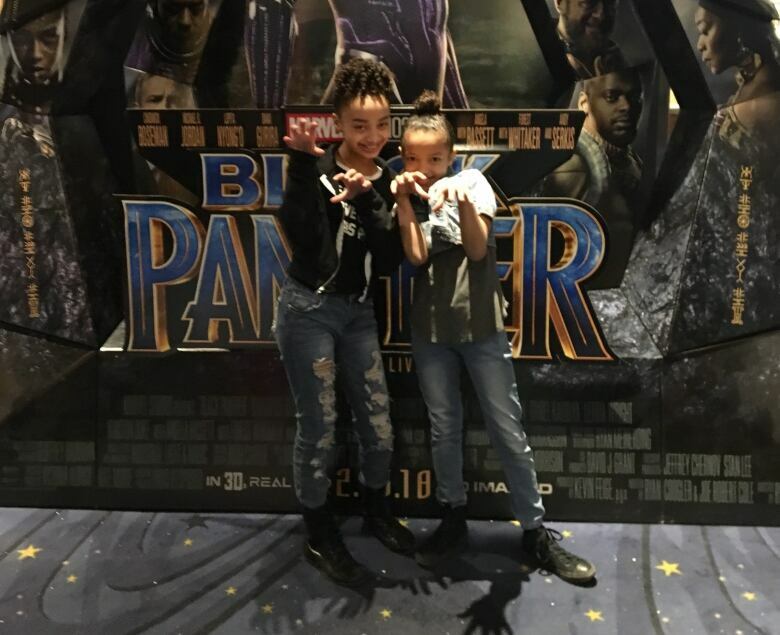 As Black Panther roared into the box office this weekend, Black Lives Matter Edmonton partnered with YEG - The Come Up, the African-Canadian nonprofit youth organization, to send 100 Edmonton youth to see the blockbuster film at a private screening Monday evening. As Black Panther roared into the box office this weekend, Black Lives Matter Edmonton partnered with an African-Canadian youth non-profit organization to send 100 Edmonton youths to see the blockbuster film at a private screening Monday evening. Black Lives Matter raised $3,100 through a GoFundMe campaign in less than 24 hours, covering the ticket cost for people who might not have the means to go and see the movie. All were welcome at the family event, where two auditoriums at the Cineplex Odeon South Edmonton Cinemas were sold out. Black Panther is a rare opportunity for black youths to see themselves represented as a protagonist, especially in a superhero franchise. It's the first time Marvel has featured a black lead superhero, and the film's cast, writers and director are also predominantly black. It's black people telling their own story, said Bashir Mohamed, a Black Lives Matter board member. "This is a great opportunity for youth to see themselves on the screen and to see themselves as superheroes and creators," he said. "And who knows? Maybe someone here could direct the next Black Panther." Organizers said they wanted the experience to bring the whole community together. "To see someone that looks like you on the big screen in such a big context is just so inspiring," said Lisa Cyuzuzo, a volunteer co-ordinator with the Youth Empowerment Group (YEG). "I just really hope that because of this movie more comes out of it — we see more representation, not just in movies, but in all different contexts, as well." Fellow co-ordinator Msgana Asefaw agreed, saying she hopes kids will want to become more involved in the community and be proud in their own skin. "It lets children know that they can do that too, even though it might be hard," Asefaw said. "It's inspiring, especially with this event. What we hope to do is inspire and to motivate and just to get people ... thinking about themselves and to know that they are able to do anything regardless of the race or the colour of their skin." Twelve-year-old Neesa-Chae Loxley was excited to see Black Panther Monday night. "I feel like this movie is a really big step for Marvel because it's the first movie where a whole bunch of their cast is black, and I feel like it's very empowering," she said. "I like watching a movie where I'm like, 'Oh my gosh, they look like me.' "
Precious Ayolade, 18, said the hype about the movie has been brewing for more than a year, and it finally feels good to be represented on screen. "Let's be honest, every superhero is white," she said with a laugh. "It feels that you can pursue what you want, no matter what your race is. Be proud of your background and your culture because no one can steal it from you. Just embrace it." It's good for people to learn about African culture, she added. "Every time you talk about Africa, you're always like, 'You guys live in bad places, a village. There's nothing really pretty about Africa' … but [this movie] makes you feel good ... Africa's really pretty, if you take the time, open your mind and just take a look." Eight-year-old Jayden Kader came dressed like the Panther himself, and wanted to know more about the character. "His claws and his mask, it's different," he said. "His mask has special powers and it has night vision on it." Monday's screening event featured African and Caribbean food, a panel discussion and entertainment after the movie. Spoken-word artist Omar Farah said the representation is nice. "The fact that it's a black man in power rather than just, 'I'm super strong and I'm going to break things.' I like the subtle undertones that are with it too," he said. "It's not just about the superhero side of movies, where it's like, 'Oh, I got a bad guy, I'm going to beat him, and move on from it.' I like the societal implications that come along with the movie." The Black Panther Challenge is a viral fundraising campaign that started in New York's Harlem neighbourhood that has spread to Canada, raising money for children to attend a free, private screening of the film.